Boar’s Head celebrates that they’re the first deli company to meet the New York City Department of Health’s National Salt Reduction Initiative (NSRI) recommended 2012 target levels for sodium in deli cold cuts and cheeses. The ad above appeared on a MetroNorth train from New York to New Haven in early September, 2010. It makes a bold claim. So bold, that I’d expect to see a typical deli sandwich have less than 50% of my sodium for the day. Sadly that’s not true. Boar’s Head is benefiting from not actually selling sandwiches. Delis use 6 oz, 10 oz or sometimes even 1 pound (16 oz) of of meat per sandwich. So, when I let the deli make my sandwich, I’m getting about 50%-100% of my days sodium from just the meat. Let alone the bread, which can easily add another 10% of your daily recommended sodium. “Maple Glazed Honey Turkey” is of my go-to deli meats . Yet, I don’t really know how that meat gets to my plate, as it doesn’t look like the turkey my mom makes on Thanksgiving. Something happens along the way, which adds lots of salt. The nutrition info above is for 2 oz servings. Yet, my sandwiches I make for myself are typically a quarter-pound, or 4 ounces. Turns out that my conservative quarter-pound of turkey meat is giving me 36% of my salt for the day–before counting the bun. 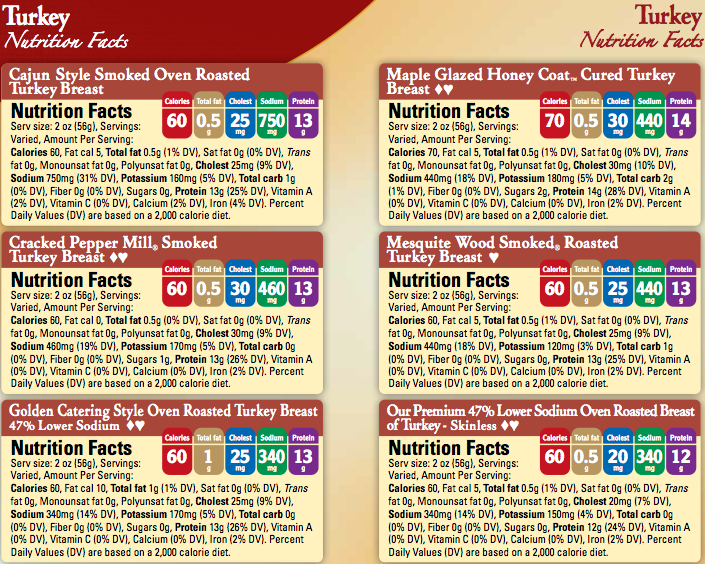 Unless Boar’s Head encourages 2 oz or 4 oz servings of their meat, they should stop being so boastful. What do you think? 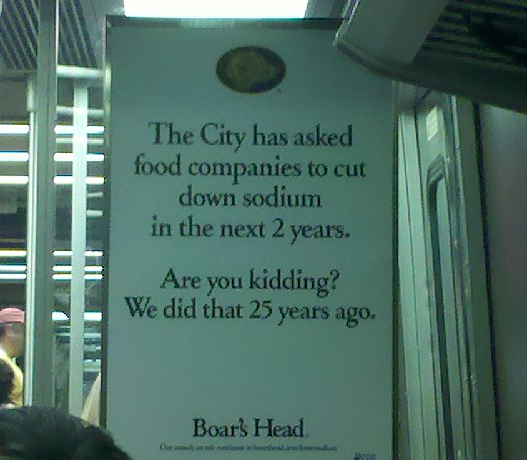 Should Boar’s Head be less boastful? Should delis standardize and charge for the amount of meat in each sandwich?